In an initiative launched at Tokyo Station on Monday, JR East is encouraging users not to leave space on one side for hurried passengers to walk up or down the escalator, but instead to stand on both sides. The campaign, which will run until Feb. 1, is aimed at preventing falls, as well as showing consideration for the elderly and passengers with disabilities, said Kuniyuki Takai, a JR East spokesperson. “The overall goal of the campaign is to promote the safety of passengers,” Takai said. 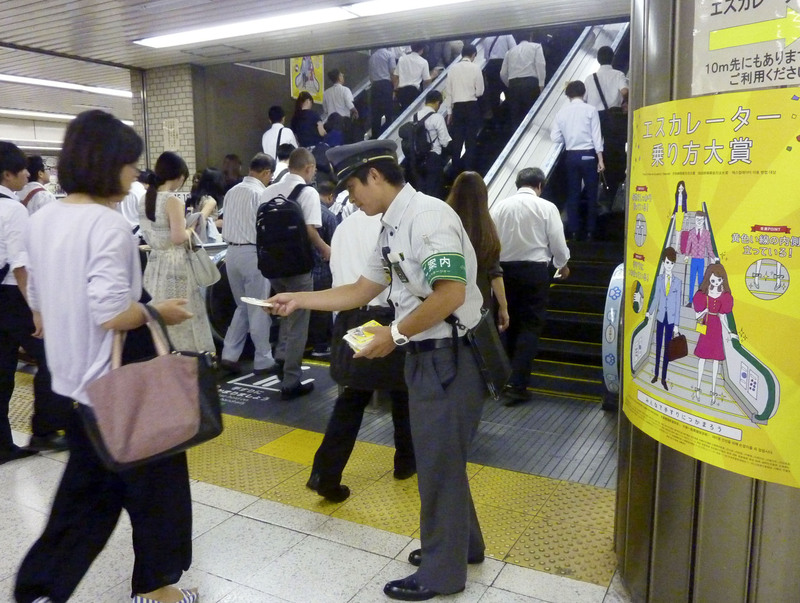 The railway company has previously run campaigns reminding passengers to use handrails for safety, but this is the first time JR East has embarked on a safety promotion encouraging them to ride the escalators two-abreast. 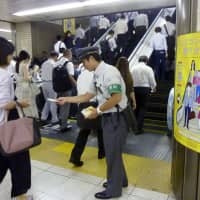 The initiative is underway at two escalators leading up to the Chuo Line platform and four escalators that connect the basement floor of the underground Keiyo Line station to the ground-level concourse. The station has posted signs, written both in Japanese and English, on walls and above escalators urging passengers not to walk on the escalator and to take the stairs if they are in hurry. “Walking on escalators may lead to accidents caused by collisions or luggage,” one sign reads. The escalators’ handrails are also decorated with pink tape and drawings of cats saying “Don’t walk!” or “Hold!” in speech bubbles. Railway officials wearing pink vests that remind passengers to use both sides and hold on to the handrails also ride the escalators with passengers as part of the effort. According to the Japan Elevator Association, a Tokyo-based industry body that compiles a report on escalator accidents every five years, the number of accidents increased to 1,475 in 2013 and 2014 from 1,200 in 2008 and 2009. The report says 882 of those cases were due to riding improperly, which includes walking up or down. It’s customary in Japan to leave one side open for people not standing on the escalator. However, Takai said the escalator is not structurally designed for walking. In 2016, Transport for London, the transportation body that manages the famous London Underground subway, rolled out a six monthlong experiment at Holborn station asking passengers to stand on both sides to reduce congestion. Media reports say that even though the experiment showed congestion could be cut by 30 percent, the plan was abandoned. It is not clear whether the campaign here will deliver change. On Monday evening at Tokyo Station, some passengers could be seen ignoring the guidance and continuing to make their way in haste by running up or down the escalator. Takai said the company hasn’t received any specific comments from station users about the campaign.